／a lure; an artificial bait: 疑似餌. ／to bait a fishhook, to put a bait on a fishhook: 釣り針に餌をつける. ／to bite; to bite at the bait; [こづく]to nibble at the bait: [魚が]餌にかかる. ／to fish for bream using prawns as(for) bait: エビを餌に鯛(たい)を釣る. ／grip: n.[しっかりと]つかむこと、握ること; [オールなどの]柄(→ grasp); 取っ手、グリップ. ／loom: n.ルーム [オールの柄の船内にある部分; オールの水かき(blade)と握り(取っ手: handle)の間の部分]、オールの柄 [水掻きと握りの中間部]、橈の柄、櫓の柄; 織機、はたおり機、機(はた). ea-kusshon-sen[船]エア・クッション船: air cushion vehicle, air-cushion vessel [1950年英国電子技師 クリストファー・コッカレルが本格的なエア・クッション船を設計し、これをホーバークラフト(hovercraft)と名付けた; 空気を船底部に吹き込むことによって船体を浮揚させながら、空中プロペラなどによって水面上を滑走する船]. ／deep sea shrimp: n.[動]深海にいるエビ [ホッコクアカエビ(deep water shrimp)、アカザエビなど]. ／Macrura; macrurans; prawns; shrimps: n.[動]エビ類、長尾類(ちょうびるい). shrimp: n.(pl. shrimps or shrimp)[動][食用]小エビ、小海老、小蝦 [小エビ・小さいエビの総称]; エビジャコ(prawn, lobster)、 vi.小エビを捕る. ／shrimps, prawns and lobsters: エビ類. e-bi-kyoukaiエー・ビー協会、米国船級協会: American Bureau of Shipping [米国; 1862年設立][略称: AB] [参照]船級協会(classification society). ／goose barnacle: n.[動]エボシガイ[総称]、エボシガイの類 [甲殻類蔓脚(まんきゃく)類に属するエボシガイ科エボシガイ属(Lepas) の動物の総称; 船底や浮木に付着する]. eboshi-dai[魚]エボシダイ(烏帽子鯛): man-of-war fish [エボシダイ科の海水魚; カツオノエボシの触手の間にいる; 全長約15cm; 世界の暖海或に分布]. echizen-kurage[動]越前クラゲ、エチゼンクラゲ、越前水母: Echizen-jellyfish, Echizen jellyfish [大型のクラゲ; かさの直径約1m; 重さ150kg]. ／rolling hitch: n.[海][ロープの]枝結び、ローリング・ヒッチ [結索法の一つで片方だけ滑らすことができる; 二重巻き結び; 円材や大索に平行に引いても滑らない結び方;　太い綱に細い綱を結ぶときの結索法; 円材や大索を移動させる時の結び方]　[参照]分野別用語"knots and splices". edanawa[延縄などの]枝縄(えだなわ): branch line; dropper [延縄の枝縄]; snood [一本釣り具のつりもと枝縄]. [参考](1)枝縄: 延縄の一部; 幹縄に等間隔に多数つけ、先端に釣針を結付する糸; (2)幹縄(みきなわ): main line. ／dropper: n.[延縄(はえなわ)などの] 枝縄(えだなわ)(→ branch line). ／snood: n.[釣]はりす(snell)、てぐす; [主に天蚕糸の] 枝縄 [延縄の幹縄に取り付けられた、針・鈎(かぎ)を取り付ける ための縄・糸]、vt. [釣]…にはりすを付ける [参照] gut／snood line. edoko餌床(えどこ): grouping bait [カツオなどが小イワシ群を追ってこれを包囲し、団塊となってむさぼり食う魚群の 有様をいう; 例えば、カツオ群がイワシ群の周りを回り、その輪をせばめていくとイワシ群は中心に集まり、ついに水面に 団子状に盛り上がるようになり、逃げ場を失なった処でカツオ群が摂餌する]. ／to train a sea lion with a food reward: [演技・ショーの]褒美に餌を与えてアシカ(sea lion)を訓練する. efu-a-ru-pi-gyosen[船]FRP漁船: FRP boat, fiberglass reinforced plastics boat. egi[釣]餌木(えぎ): [参考]小魚やエビに似せた形の擬餌(ぎじ)・疑似餌;　餌木は日本の伝統的漁法 [参考]エギング: 餌木と称される日本古来から用いられてきたルアーによる釣り. ／A 1: ＝A one (adj. [船が]第一級の; 一流の). ／able seaman, able-seaman, able-bodied seaman: [海]A.B.級の海員(水兵)、熟練有資格甲板員、甲板員適任証所有者、適任船員 (＝able-bodied seaman)、熟練甲板員、熟練船員 [略: A.B.(cf. 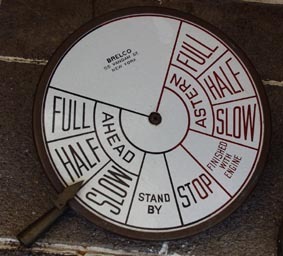 ordinary seaman)]; [英国海軍]二等兵(→ navy). eichi-emu-esuH.M.S. : "His Majesty's Ship"、または"Her Majesty Ship"の略。英国軍艦のこと. ／to haul on a rope with a "[yo-]heave-ho". ei-fure-muエイ・フレーム、A-フレーム、A型フレーム: A-frame, 'A' frame [海洋調査船、調査潜水艇への支援母船などの 船尾に設けられた構造物(クレーンの一種)で、潜水艇・大型海洋調査機器の揚げ降ろしに用いられる]. eikoku-gunkan英国軍艦: →　His(Her) Majesty's Ship: [英国]英国軍艦. eikoku-kokuritsu-kaiyou-hakubutsukan英国国立海洋博物館: National Maritime Museum, UK. ／acorn: エイコーン [椎の実型の檣頭(しょうとう)飾り] [英語]an ornament at the head of a mast fashioned in the shape of an acorn. [参照]tow: n.ロープで引くこと、引かれて行くこと; 引かれる船(車); 引き船(車); 引き綱(鎖); 曳船用ホーサー; 被曳船、 引かれ船; 曳き船; 麻屑、麻類の精麻工程中除かれた屑繊維、vt.[舟など]をロープ(鎖)で引く、引っ張って行く、曳船する. ／an aircraft that tows a magnetometer: 磁力計を曳航する航空機. ／in tow: […に]引かれて[of, by　…]. ／in tow of　…: …に曳かれて. ／to cast off tow: 被曳船を放つ. ／to take in tow: 曳船する; 曳索を取り込む. ／to take(or have) in tow: [破損船など]をロープで引く. ／to tow alongside: 横付け曳航する; 抱き舟する. ／to tow in to: 曳船して…に入る. ／to tow to　…: …へ曳船する. ／to tow(pull) a net: 曳網する. ／the swept area of a trawl: [例えば、トロール網の海底における]曳網面積. ／alewife: n.(pl. -wives)[米国][魚][北米産]エイルワイフ、ニシン科の魚、ニシンの一種 [北米大西洋岸で多産する] [海・湖・川などで獲れる]. ／guest rope: [曳船の; 引き船に取り付けた]第2の曳索(引き綱); [海]つかまり綱、ゲスロープ(＝grab rope). ／half and timber hitch: n.[ロープの]曳索結び. ／tug(tow) line(rope), tug(tow) rope: 曳索 [引き船の曳索; 曳航する時のロープ・綱](→ ひきづな). eisei-kouhou衛星航法、人工衛星航法: satellite navigation／satellite navigation system: n.人工衛星航法システム. eisen曳船(えいせん): tugboat, towing boat [他船を曳航したり、航行の補助として用いられる船]／towage: n.曳船料. ・　seal rookery: n.アザラシ(オットセイ)繁殖地、集団営巣地(→ colony). ／long ton: n.英屯、英トン [イギリス本国およびその属領地で使用される重量単位で、1 long tonは2,240ポンド（lbs）]. ／nutrition: n.栄養物摂取; 栄養作用; 栄養物、食物／nutrition coefficient of feed: 餌料の栄養率. eiyou-enrui栄養塩類、栄養塩(えいようえん): nutrient salts [生物が正常の生活を営むのに必要な塩類]; nutritive salts. ／prey: n.[他の動物の]餌食(えじき)、餌食となる動物、餌動物、被食者、餌(えさ)、獲物(→ predator); [動物の行なう]捕食; 捕食する習性; 犠牲、vi. […を]捕食する、餌食にする、食い物にする[upon, on　…]. ／a fish of prey, prey fish: [他の動物に食われる]餌魚(えさざかな). ／An eagle preys on smaller birds and animals(cf. to live on): 鷲(わし)は小鳥や小動物を捕って食べる. ／to fall prey to　…:　…の餌食(犠牲)になる. ／to feed the fishes: 船に酔って吐く、船酔いする;　海の魚の餌食となる、溺れて死ぬ(溺死する). ／to prey on small animals: 小動物を捕食する. ／to liquefy: vt. …を液化(溶解)させる; vi.液化(溶解)する. ekika-gasu-sen[船]液化ガス船: LNG tanker, LPG tanker [液化ガスを専用に運ぶ船]. ekika-sekiyu-gasu-sen[船][例えば、積載量75,000立方メートルの]液化石油ガス船: LPG tanker [これも一種の専用船(a vessel specialized in　…)]. ekishin-hyouhon[魚をホルマリンに浸した]液浸標本: specimen in formalin [formaldehydeの水溶液で、 殺菌剤・防腐・消毒剤; FORMAL[DEHYDE]＋-IN] [参考] formaldehyde: [化]フォルムアルデヒド (FORM[IC]＋ALDEHYDE). ekitai-rashingi液体羅針儀、液体コンパス: fluid(liquid) compass [磁気コンパスで、バウル(盤)の中に液体を充たして、 液中重量を軽くして軸針にかかる摩擦を少なくするなどの構造にしたもの]. Ekuman-merutsu-ryuusokukeiエクマン・メルツ流速計: Ekman-Merz current meter, Ekman-Merz currentmeter [エクマン 及びメルツによって考案された流速計(海流計)]. Ekuman-saisuikiエクマン[式・型]採水器: Ekman water bottle, Ekman water sampler [エクマン(スウェーデン)が 考案した転倒採水器]. emochigun餌持ち群: shoal with bait [回遊中のカツオなどがイワシなどの餌を追っている状態]. emu-o-sen, MO-senMO船: [参考]機関室を無人運転できる条件を備えた船; 機関部が航海当直に就かないいわゆる「MO運転」 にするか否かは、航行海域の状況、気象条件などを考慮して決められる. ／angle worm, angleworm: n.[釣り餌(え)に使う; 魚釣り用の; 釣りの餌にする]餌虫(えむし) [ミミズ(earthworm)など]. ／saline: adj.塩の; 塩分を含んだ(cf. saltish)、セイライン; 塩気のある(salty)、塩辛い、塩のような、塩水性の; [特にアルカリ金属、マグネシウムなどの]塩類の、塩性の、n.塩水湖、塩沼; 塩田、製塩所; (～s)塩類、含塩物. ・　a saline lake:　n.塩水湖. ・　saline water:　n.塩水 [参考] desalt: vt.塩分を除く、[海水などを]脱塩する(＝desalinate)、海水淡水化する(to desalt seawater). ／salinity-temperature-depth recorder: n.塩分・水温・水深記録器、塩分・水温・深度自動測定器 [略: STD, S.T.D.]. enbun-suion-suishin-jidou-sokutei-ki塩分・水温・水深自動測定器、塩分・温度・深度記録器: salinity-temperature- depth recorder [略: STD, S.T.D.][電気的な方法で塩分・水温・水深が同時に自記される計器]. ／apogean: adj. [天]遠地点(apogee)の [対語] perigean, -geal: adj.[天]近地点(perigee)の. ／apogee: [天文]遠地点; 最高地点(the highest point)、最遠隔[地]点. ・　the higher apsis: [星の]遠日点;　[月の]遠地点. ・　the lower apsis: [星の]近日点;　[月の]近地点. enchiten-chou[海]遠地点潮(えんちてんちょう): apogean tide (pl. apogean tides) [月が遠地点の近くにある頃の潮汐; 近地点潮に対する語]. enchokubiki鉛直曳(えんちょくびき)、鉛直びき、垂直びき: vertical haul; vertical hauling [プランクトンの採取 の一方法; 停船中に下ろしたネットを垂直に引き上げる方法]. enchokusen鉛直線: →　deflection of plumb line: 鉛直線偏差 [その地における測地経度・緯度と天文経度・緯度 とのそれぞれの差]. ／elongated form: 延長形／elongated fish: n.延長形魚 [ウナギ、アナゴなど]. [参考]pillar:　n.[船]梁柱 [例えば、甲板を支える梁を下から支える柱など];　柱、ピラー、台脚(pedestral);　柱状のもの. ／spar-type platform, which is somewhat like an angler's float: [例えば、温度差発電(OTEC)用の]おおよそ釣り人の 浮きのような円柱型をしたプラットフォーム. ／salt pan, saltpan: n.[製塩用の]塩釜; 天然塩田、[海岸の自然の]塩田; [干潟の]潮だまり. ／(2)inshore: adj.海岸に近い、近海の、沿岸の(opp. offshore) → inshore patrol; coastal patrol: 沿岸パトロール. ／(3)littoral: adj.沿岸(沿海)の; [生態・生物地理]沿岸に棲(す)む・住む、沿岸性の、n.沿海地方; [生態]沿岸帯、 [特に]潮間帯. coast: n.沿岸、海岸・海辺(seashore); 沿岸地域、海岸地、海岸地帯(cf. littoral) [類語]shore; [the C～][米国・口語] 太平洋沿岸地方. ／coast guard: 沿岸警備隊→　the United States Coast Guard: 米国沿岸警備隊 [略:　U.S.C.G.]. ／[from] coast to coast: [米国]大西洋岸から太平洋岸まで、全米で、全国で. ／coast traffic: 沿岸貿易、内地貿易→　coastline traffic: 沿岸貿易. ／from the Coast to the Coast: [米国]大西洋岸から太平洋岸まで、全米で、全国で. ／coastal defense: 沿岸防備　[参考] sea defense: 海防. ／coastal erosion, beach erosion: 海岸浸食. ／coastal error, coastal refraction: 海岸線誤差. ／coastal fisheries, neritic fisheries: 沿岸漁業. ／coastal region: 沿岸[域・部] [陸地に接した、ごく近い海域](→ littoral region); 沿岸水域. ／coaster: n.沿岸航路船、沿岸航行船、沿岸船、沿岸貿易船(→ coasting vessel, coast liner); 沿岸貿易業者. ・　The ship sailed coastwise. : その船は海岸に沿って航行した. ／inshore: adj.海岸に近い、近海の、沿海・沿岸の(opp. offshore)[西語: cerca de la coasta]、海岸に向かう、 陸の方へ、海岸に近づく、adv.海岸で、近海で; 海岸に向かって. ・　inshore of　…: …よりも海岸に近く. ・　The boat went closer inshore: ボートはだんだん岸の方へ接近して行った. ・　The ship lay inshore: 船は岸の近くに停泊していた. ／littoral fisheries experimental station: 臨海水産実験所(実験場). ／littoral system: [英語] depth region that contains the eulittoral and sublittoral zones. ／the littoral zone: 沿岸帯; 沿岸地域. ／longshore bar; offshore bar:　n.沿岸州(えんがんす). ／longshore current, alongshore current: n.並岸流(へいがんりゅう)、沿岸流(littoral current). ／longshore drift; drift sand: n.漂砂(ひょうさ). ／nearshore current system, near-shore current system: n.海浜流系. neritic: adj. [海洋・生態]浅海の、浅海帯の、沿岸の、沿岸性の [海岸沿いの水深約200m以下; (1)oceanic depth zone extending from ocean surface to 0.2 kilometer depth; (2)of, relating to, or constituting the belt or region of shallow water adjoining the seacoast. ／shore-based: 沿岸用の、沿岸陸地の、沿岸陸地に設置された→ shore-based wave recorder: 沿岸用波浪計. ／cabotage: n.沿岸貿易; [外国船(航空機)の]近海(国内)運航[権]; 国内運航を自国船(航空機)に限定する運航権; 沿岸航行、沿岸航海 [西語] cabotaje. ／coasting: adj.沿岸航行の; 沿岸航路の、近海航路の; 惰性で進む、n.沿岸航行、海岸航行(coasting voyage)[海岸線に沿って航行すること]; 沿岸貿易; 沿岸線、海岸線(coast line; coastline)[の地形];　海岸線図; 惰行、惰走、惰力運転 [西語] cabotaje. ・　coastwise trade, coastwise traffic: 沿岸貿易(交易・取り引き). engan-gyogyou沿岸漁業: coastal fisheries; shore fishery; neritic fisheries; inshore fisheries. engan-gyogyou-kaizen-shikin-josei-hou沿岸漁業改善資金助成法: Coastal Fishery Improvement Fund Aid Law. engan-gyogyoutou-shinkou-hou沿岸漁業等振興法[日本]: Coastal Fishery Promotion Law. engan-gyojou-seibi-kaihatsu-hou沿岸漁場整備開発法[日本]: Coastal Fishing Ground Improvement and Development Law. ／coastal region; coastal zone; neritic region: [生物分布などでの]沿岸域. ・　prevention of disasters in coastal zone: 沿岸域での防災. engan-kaisen沿岸回船: →　hoveler: n.[主に英国: hoveller][臨時仕事をする]沿岸回船; [沿岸回船の無免許の]水先案内人、 無免許水先案内人. ／coast guard, Coast Guard: [一般的に]沿岸警備隊; 沿岸警備隊員 [主として自国周辺海上の保安、警備、海難救助に 当たる機関]; [英国]沿岸警備隊[員][海難救助、密貿易・密入国取り締まりなどに当たる]; [米国](C～ G～)沿岸警備隊 [員][海難救助・密貿易の取り締まり・関税取立て・入国管理法の執行などに当たる]. ・　the hooligan Navy: [米国海軍俗称]沿岸警備隊(the Coast Guard). ・　the U.S.Coast Guard: 米国沿岸警備隊→　the United States Coast Guard: 米国沿岸警備隊 [略:　U.S.C.G.]. ／[a U.S.] coastguard[s]man: n.(pl. -men)[米国の]沿岸警備隊員. ／hoolingan Navy: n.[the ～][米国海軍俗称]沿岸警備隊(the Coast Guard). engan-kougaku-kenkyuu-senta-沿岸工学研究センター: Coastal Engineering Research Center[米国]. [参考] cabotage: navigation along the coast; coasting trade [to carry goods from one port of a country to another of the same country with its own flag fleet. 海岸に沿って航行すること; 沿岸貿易[自国旗を掲げて自国内の港から港へ物資を運ぶこと]. ／coasting lead: [海]浅海用測鉛、沿岸航行用測鉛 [水深20～60尋(ひろ)用; 沿岸航行において用いる比較的小型の測鉛]. ／coasting line, coasting route: 沿海航路. ／coasting pilot, coast pilot: 沿岸水先人. engan-kouro沿岸航路: coasting, coasting line [沿岸航行に用いられる航路]. ／coasting: adj.沿岸航行の; 沿岸航路の、近海航路の; 惰性で進む、n.沿岸航行、海岸航行(coasting voyage) [海岸線に沿って航行すること]; 沿岸貿易; 沿岸線、海岸線(coast line; coastline)[の地形];　海岸線図; 惰行、 惰走、惰力運転 [西語] cabotaje. engan-no沿岸の、沿岸帯の: coastal, littoral, neritic, longshore, near-shore. ／inshore current; littoral current; coastal current: [海]沿岸流 [沿岸に沿って水の表面を流れる潮流。磯波のために生じる]; 海岸流. ／barrier beach: n.沿岸洲、堤洲(ていす) [海岸線沿いに平行的して、湾口・河口に生じる長い砂州・砂洲(さす)]、 海岸に沿ってできた長い洲(す). ／offshore bar; longshore bar: n.沿岸州、沿岸洲(す)(えんがんす) [沿岸砂州ともいう]. engan-suiro[海氷での]沿岸水路: shore lead　[参考]lead: n.(the～)指導的地位; [競技などで]リード、勝ち越し; [海]リード、すべり弁索導器; 氷原中の水路. ／angelfish: n.(pl. -fish or -fishes)[魚]エンジェルフィッシュ[鑑賞用熱帯魚の一種]; カスザメ(monkfish, angel shark); シテンヤッコ属の各種の熱帯魚. enjiniaringu-shinkou-kyoukaiエンジニアリング振興協会: Engineering Advancement Association of Japan. ／engine telegraph: n.エンジン・テレグラフ、機関運転伝令(指示、通信)器、機関室伝令器、速力通信器 [参考]船橋から船内の機関操作場所(機関室)へ主機関の運転・操作 [前進、後進、停止、速力など]に関する指令(伝令・伝達)する 指示(通信)器 [参照画像: engine telegraph(1 & 2)(z138.gif & z732.jpg)]. enjitsuten遠日点(えんじつてん): (pl. -lia)[天文]aphelion [太陽を１焦点とする楕円軌道上を 運動する惑星が、軌道上で最も太陽から遠ざかる位置; 惑星・彗星(すいせい)・人工衛星などが太陽から最も隔たった(遠ざかる) 点](opp. perihelion). ／the higher apsis: [星の]遠日点;　[月の]遠地点. ／the lower apsis: [星の]近日点;　[月の]近地点. ／marginal sea: n.縁海 [付属海の一つ; 大陸の外縁にあって島や半島で不完全に囲まれた海;　ベーリング海、 オホーツク海など]; 沿海、沿岸海. ／inshore: adj.海岸に近い、近海の、沿海・沿岸の、縁海の [海岸と水深200m線との間の水域](opp. offshore)[西語: cerca de la coasta]、 海岸に向かう、陸の方へ、海岸に近づく、adv.海岸で、近海で; 海岸に向かって. ／maritime: n.(the M～s)[カナダの]沿海州(＝the Maritime Provinces) [Nova Scotia, New Brunswick, Prince Edward islandの3州]　[西語](adj. )marítomo, ma. ／Maritime Provinces: (the ～)[カナダの]沿海州 [Nova Scotia州, New Brunswick州, Price Edward Islandを含むところの総称]. ／Far Sea Fishery Division: n.遠洋漁業課. ／pelagic fish: 浮魚(うきうお); 遠海魚 [参考]底魚; 遠海魚: demersal fish. ／remotely operated vehicle, remote-operated vehicle: 遠隔操縦探査機 [略: ROV]. ／sodium chloride: n.[化]塩化ナトリウム、食塩(→ 塩化)／sodium: n.ナトリウム [Na]. ／cured cod: 塩干しタラ、干しダラ→　salted cod: 塩ダラ. ／cured fish, salted and dried fish: 塩干魚 [参考][魚類・肉類の]保存[法]、貯蔵[法]、vt. [乾燥や塩蔵で]を保存する、 貯蔵する(＝preserve): cure. ／a herring cured in smoke: 薫製(くんせい)のニシン. ／salty: adj. (saltier, -iest)塩を含んだ、塩気のある; 塩辛い; 海の; 海の香りのする; 海上生活の. [参考]円口類: ヤツメウナギ目とメクラウナギ目の２種類がある; 形はウナギに似ているが全く違う種類で、顎がないので無顎類 と呼ばれる仲間; しかし、無顎類の魚は現在この円口類しかいない／ヌタウナギ [メクラウナギ目に属する]. ／cyclostome: adj.円い口をもった; 円口類の、n.円い口をもった魚; 円口類の魚 [ヤツメウナギ(lamprey)などの魚類]、円口類. ／knoll: n.小さな円い丘、小さな丸い丘(hillock)、円形に近い小丘、円丘、塚、浅瀬の頂部; 洲、砂州;　[海底の]小海丘、円丘 [参照]海丘、小丘. enmu.煙霧(えんむ): smoke fog [主に煙のために生じた沖合いの霧](→ smog). ／cycloid: n.[動]円鱗魚、サイクロイド; [幾何]サイクロイド、adj. [魚]丸形の、円[形]鱗をもつ、 [魚の鱗(うろこ)が]円鱗の(cf. ctenoid); 円形の(circular). ／haloplankton: n.[生態]塩生プランクトン [英語] haloplankton: Organisms whose life cycle is spent in the plankton. ／halobiont: n.[生態]塩生生物 [参考]halo-: saltの意味を表す連結語 [母音の前ではhal-を用いる: 例えばhalogen]. ／halophyte: n.[生態]塩生植物(cf. mesophyte) [「halo」はsalinity、「photo」はplantの意味。塩生植物とは高塩濃度に 耐える種子植物をいう;　海岸・塩湖周辺に生え、独特の群落を形成する]. ／halophytic: adj. [植物など]塩生の(＝salsuginous) [参考] halobiont: [生態]塩生生物. ／chlorinity determination: 塩素量検定、塩分検定(→ salinity determination). ／brine: n.塩水(salt water)、濃塩水、鹹水(かんすい)、ブライン [例えば、冷凍機において間接冷凍の冷媒として 用いられる不凍溶液のこと]; 海水(sea water);　[漬物用の]塩水(→ brining);　[化学]塩類溶液. ／brine freezing: ブライン凍結→　brine freezing method: 塩水凍結法. ／brine pan: 塩釜(しおがま) [海水を蒸発させて製塩するための釜];　[塩田の]製塩坑. ／briny: adj. (brinier, briniest)塩水の、海水の; 塩辛い(salty)、塩気のある; 塩水のような → a briny taste:　塩辛い味. ／hot brines and heavy metal deposits in the Red Sea: 紅海の高温塩水(ホット・ブライン)及び重金属鉱床. ／Red Sea geothermal brine deposits; their mineralogy, chemistry and genesis: 紅海の地熱起源[性]の塩水鉱床; その鉱物学、化学及び起源. ／saline: adj.塩の; 塩分を含んだ(cf. saltish)、セイライン; 塩気のある(salty)、塩辛い、塩のような、塩水性の; [特にアルカリ金属、マグネシウムなどの] 塩類の、塩性の、n.塩水湖、塩沼; 塩田、製塩所; (～s)塩類、含塩物. ／conical buoy, cone buoy: n.円錐形浮標、円錐[形]ブイ [水面上の標体が円錐形になっている浮標]. entoropi-エントロピー: entropy → entropy law: n.エントロピーの法則. ／cowl: n.修道服の頭巾(ずきん);　煙突帽 [煙の逆流を防止する];　[通風筒の]集風器. ／smokestack: n.[汽船・工場などの]煙突 [参照] funnel: n.ファンネル. ／casing: n.[海][汽船の]煙突を包む壁; [船]囲壁、窓わく;　[油井などにおいて、掘削された孔を保護する] 鉄製パイプ; 箱、外被;　[窓・扉などの]枠、縁; 包装、包装材料. ／chimney: n.煙突;　[汽船・蒸気機関車などの] 煙突、煙筒(えんとう)(funnnel, smokestack); 煙突状のもの、チムニー [例えば、海底において熱水が噴出する塔状の自然物]. pelagic: adj.海洋の、大洋の; [coastalに対して]遠洋の、遠洋に棲む・棲んでいる、遠海の、深海の(に棲む)、外洋性の; [特に底生 に対して; benthonicに対して]遊離性の、漂泳性の、漂泳区の; 遠洋で行なう(opp. littoral). ・　pelagic fishery; high-seas fishery, high seas fishery; far sea fishery; long-distance fishery: 遠洋漁業. ／pelagic fishing vessel(boat): n.遠洋漁船(→ long distant fishing vessel). ／pelagic sediment: n.遠洋性堆積物、遠洋性沈殿物 [遠洋の浮遊生物の遺骸を主にする、各種の軟泥類からなる; ocean basin sediment derived primarily from remains of marine animals]. ／pelagic skipjack and tuna fishery: n.遠洋カツオ・マグロ漁業. ／pelagian, pelagic: adj.遠洋の、遠洋に住む(棲む)、遠海の、深海の(に棲む)、外洋性の; [特に底生に対して]漂泳区、漂泳性の; 遠洋で行なう; 海洋の [対語]coastal. en'you-futeiki-sen遠洋不定期船: →　ocean tramp: n.遠洋(外洋・外航)不定期[貨物]船. ／a long-distance fishing nation(country), a distant-water fishing nation: 遠洋漁業国 [略: DWFN]. ・　distant-water fishing nations operating longliners, DWFNs operating longliners: 延縄操業をしている遠洋漁業国. [文例]Many long-distance fishing nations continue to insist on their long-standing freedom from anything but international controls. : 遠洋漁業国は、国際管理以外のいかなる規制からも自由であることに長年にわたって 固執し続けている. ／seagoing: adj. [船が]遠洋航海の(に適する)、航洋性のある; [人が]航海を業とする、船乗り業の; [魚が産卵のために]海へ 下る(catadromous)、n.＝seafaring. en'you-koukai遠洋航海: a long-distance cruise(navigation); distant voyage; ocean navigation. ／a seagoing vessel: 航洋船、外洋航行船 [西語: buque de navegación de altura] [参照]ocean-going vessel. ／ocean lane: n.[海]遠洋航路、大洋航路(＝ocean route)、遠洋航路帯、オーシャンレーン(→　ocean route). ／hatch coaming: n.[船]倉口(艙口)縁材(えんざい)、船艙縁材、ハッチ防水縁材、ハッチ・コーミング　[西語: brazola de escotilla]. ／salted fish: 塩蔵魚. ／salting: n.塩蔵、塩漬け、塩に漬けること. episenta-エピセンター: epicenter [参考]Point on the earth's surface directly above the earthquake focus. ／apron: n.エプロン [船首ブルワークの最上部分];　船首舷墻(げんしょう)補強板;　船首添板;　[木船での]副船首材;　前面張り出し;　測鉛手の膝おおい;　[土木]護岸構造物 [水害防止のために海岸・堤防などを保護する];　水たたき、 護床、護床構造物、エプロン [例えば、ダム・堰などにおいて、落流で川床がえぐられたりするのをする防止する構造物];　[荷揚げ用の]桟橋(さんばし)、船荷積み降ろし用区域、エプロン [埠頭、波止場などの貨物積み降ろし用のスペース、あるいは 荷捌き地];　前掛け、エプロン. ／branchio-: 「鰓(えら)」(gills)を意味する連結形 [母音の前ではbranchi-を用いる]　[例](1)branchiopod: adj.,n.[動]鰓脚類(さいきゃくるい)の[動物]、(2)branchiate. ／branchiostegal:　adj.→　branchiostegal membrane: 鰓皮／branchiostegal rays: 鰓条. ／epibranchial: adj.→ epibranchial bone: n.上鰓骨／epibranchial groove: n.鰓上溝. ／gill [of a fish]: n.(通例pl. )[魚類の]鰓(えら)(branchia) [英語]gill: Feather-like organ found in many marine invertebrates and fish that is used for respiration. ・　to gill: vt.[魚]を刺し網(gill net)で捕える(捕る); [魚の]鰓や腸(はらわた)を抜く(＝gut). ／septibranchiate: → septibranchiate type: 隔鰓型. ／beard: n.[動][牡蛎(かき)・蛎(かき)・カキなどの]えら、ひら; [釣り針・網針・編針・矢・矢尻などの] かぎ (barb, hook)、あご、[釣り針の] あぐ(→ barb); [貝の]足糸; あごひげ、ひげ. era[動]えら: →　era: n.[動]えら、えんば [鯨鬚のこと] [同義:　おさ、ひげ]. ／operculum: (pl. -la or lums)[動][魚類の]えらぶた、鰓蓋(さいがい); [動][貝類の殻口の]へた、貝ぶた、蓋(ふた); [カブトガニの]蓋板; [植]ふた. 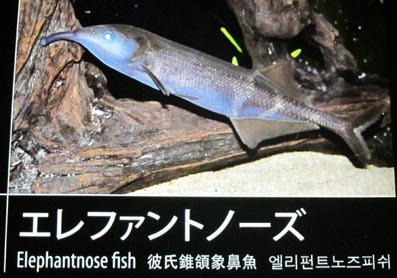 erefanto-no-zu[魚]エレファントノーズ: elephantnose fish [画像(z22282.jpg) ／サンシャイン水族館]. ／brush weir: えり(魞)[の類(たぐい)]、簀立(→ brush trap)、簀(す)建の類. ／fish corral [魚柵(さく)の類], hedge(→ brush weir, pound net, weir [やなの類]):　n.えり(魞). [参考]えり(魞): 川・湖沼などで、魚の通路に竹す(竹のすのこ)を渦のような形に立て、迷路状に仕掛け、魚が入りやすく出に くいようにしながら魚を誘導して捕らえる仕掛け[定置漁具の一種]／魞(えり)漁: cf. 琵琶湖の伝統漁業. ／fish corral: n.えり [小型定置漁具]、魚柵 [参考]えり: 川・湖の魚を捕る仕掛け。魚の通る道に竹すを立て、 細長く曲げて袋状にしたもの [参考] corral: [牛・馬などの]家畜囲い(pen); 野獣を生け捕りにする柵. ／fish court: n.[網えり類の末端の]魚捕(うおどり)、魚捕部、魚捕り部、魚溜り [参考] court: n.[博覧会・博物館の]展示品のため に割り振った区画. ／hedge: n.えりの一種、えり類 [主に八重簀の類]　[参考]えり(魞):　湖・川などで魚を捕るための仕掛けの一種。 魚が通る道筋に沿って、竹で編んだ柵(竹す)などを、湖底・川底に袋状に立てかけた仕掛け. eru-enu-ji-sen[船]LNG船: liquified natural gas tanker、LNG tanker [超低温・高圧力の液化天然ガスを専用に 運搬する船]／LNG-fueled ship: LNG燃料船. eru-pi-ji-sen[船]LPG船: liquified petroleum gas tanker [超低温・高圧力の液化石油ガスを専用に運搬する船]. erutsu-kajiエルツ舵: Oertz rudder [流線型の舵の一種; 舵柱を取り囲んで固定された前半部分と、普通の舵のように動く後半部分とからなり、 合体して流線形状をなす舵]. bait: n.[釣り針・わななどに付ける] 餌(えさ)、餌料(じりょう)、えば; おびき寄せるもの、おとり; 誘惑 [西語][漁] carnada, cebo. ／an artificial bait: 擬似餌(ぎじえ)、擬餌(ぎじ)、人工餌料、にせえ(decoy)(→　lure). ・　bait casting: [釣]ベイト・キャスティング [参考]両軸受けリール付きのロッドで、比較的重いルアーを投げる こと(技術、釣り); ベイト型リールを使用した投げ釣り. ・　bait fishing: 餌釣り(えづり・えさづり)、餌釣り漁→　baitless angling, angling without bait: 空釣り. ・　bait tank: 餌料用タンク(水槽)、活魚槽・活餌槽(bait hold, live bait hold, bait well, live bait tank)、魚倉. ／to bait: vt.[釣り針・わな]に餌をつける; [釣り場]に餌をまく; 餌でおびき寄せる→　釣り針に餌を付ける: to bait a fishhook. ／to bait a hook: 釣り針に餌を付ける. ／to put a bait: 餌を付ける[on a hook, in a trap]. ／to rise to a(the) bait: [魚が]餌を食いに水面近くにくる. ／to take: vi. [魚が]餌に食いつく、[餌鉤・(かぎ)・わななどに]かかる、[魚・鳥が]かかる、つかまる、 vt.[わな・餌などで]捕える; [敵船を]捕獲(拿捕・だほ)する. ／to take a bait: 餌を食う [参照] snap: n.食いつくこと(食いつき)、vi.[ぱくりと]食いつく、かみつく. ／dough-ball: n.パンくずと肉桂(にっけい)皮で作った釣りの餌　[参考] dough: n.[パンなどの]生地(きじ)[粉に水をよく混ぜてこねた、 焼く前の塊]. ／[fish] feed: [魚の]餌→　a bait; [囮、おとり]a decoy, a lure: [釣りの]餌. ・　to feed [the fishes]: [魚に]餌をやる. ・　to train a sea lion with a food reward: [演技などの]ご褒美に餌を与えて sea lion を訓練する. ／forage migaration:　n.索餌回遊、[文例] The foraging and nursery ground areas of many animals, such as shrimps, are often threatened by such discharges. : 例えばエビのような多くの動物が索餌したり、生育の場とする水域がそのような排出によって しばしば脅威にさらされている. ／gudgeon: n.餌(えさ)(bait)、好餌(こうじ)、誘惑者(allurement); [魚]キタノカマツカ(→ Gobid gobid)、 タイリクスナムグリ [コイ科;　欧州産の小さい淡水魚]. ／ledger bait: [釣][ぶっ込み釣りの]底餌、固定餌(こていえさ)(→ ground bait) [参考]ledger: vi. [釣]ぶっ込み[仕掛け]で釣る、 n.[足場の]横木; [会計]原簿、元帳、台帳. ／nibble: n.少しずつかむこと; [魚が]餌(えさ)をつつくこと; ごくわずかの量; [魚の]一口の量、一かみの量. prey: n.[他の動物の]餌食(えじき)、餌食となる動物、餌動物、被食者、餌(えさ)、獲物(→ predator); [動物の行なう]捕食; 捕食する習性; 犠牲、vi. […を]捕食する、餌食にする、食い物にする[upon, on　…]. ／sliver: n.[木・材木などの]細長い断片・一片;　[餌に用いる]小魚の片身、小魚の片身(かたみ)[釣り餌]、 vt.縦に長く切る・裂く; [魚]の片身を切り取る. ／to dap: v.(-pp-)vi.餌をそっと水面に落とす、餌を水面に浮き沈みさせて釣りをする; [鳥などが]ひょいと水にもぐる [餌を取る時など]、vt.[釣餌を]水面に浮き沈みさせる. esa-doubutsu餌動物(えさどうぶつ): prey; prey animal (cf. predator) [参照]餌(えさ)、捕食、餌食. ／lizardfishes, Synodontidae: eso-ka[魚]エソ科 [参考]硬骨魚綱ハダカイワシ目の１科＝エソ科の海水魚の総称。 普通マエソを指す。浅海底にすみ、小魚・小動物を捕食する。蒲鉾の原料となる. esu-a-ru-kyoukaiエス・アール協会: Register of Shipping of the USSR [ソビエト; 1935年設立][略称: SR] [参照]船級協会(classification society). ／left-hand ordinary lay: n.普通S撚り、ラング右撚り [子綱の撚り方向と仕上がりの撚り方向とが反対で、仕上がりが右撚りの綱索]. etsu[魚]エツ: estuary tapertail anchovy [カタクチイワシ科の海水魚]. ezo-ainame[魚]エゾアイナメ: →　lingcod, ling-cod: n.[魚]エゾアイナメ、キンムツ、北米太平洋沿岸のアイナメ科の魚. ／ivory shells, whelks, Buccinidae: [貝]エゾバイ科 [腹足綱・新腹足目の１科]. ezo-kumodako[動]エゾクモダコ: →　spider octopus: n.[動]エゾクモダコ、クモダコ. ezo-kusauoエゾクサウオ: →　Agassiz snailfish: n.[魚]エゾクサウオ／Agassiz's snailfish: エゾクサウオ. ezo-nunomegaiエゾヌノメガイ: Adams' thin shelled littleneck. ／soft-shell clam: n.[貝]オオノガイ(大野貝)(＝soft clam, steamer, soft-shelled clam)[殻の薄い食用二枚貝](→ gaper). ezo-wasure-gaiエゾワスレガイ: North Pacific sunray clam.